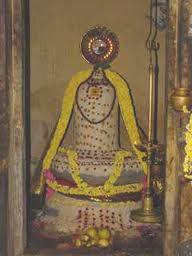 Today is the Poornima occuring in the Tamil month of Aippasi. It is an auspicious day to offer Annabhishekam for Lord Shiva. Temples to Lord Shiva all around the world will be conducting the ceremony of offering food abhishekam to the Lord. Kilos of cooked rice and garlands of vegetables and fruits are being offered and witnessing this event/abhishekam is supposed to relieve one from the clutches of birth and death cycle. I am also planning to attend this event at my local temple that has a great Shivan shrine in it. Planning to make garland of small vegetables like string bean, cluster bean, and such. Imagine tons of prepared food offered to the enormous murtis of Lord Shiva at Tanjore Brihadeeshwara temple and elsewhere... it is simply one-of-a-kind event to not miss it! Hope this message benefits some!